9/27/2007 – A free day at the World Championship means more hard work for the players. 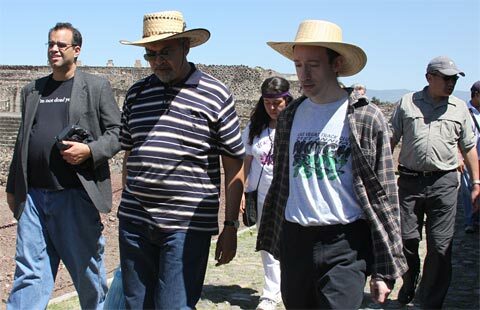 But not for journalists and dignitaries, who are given the opportunity to visit places of interest. 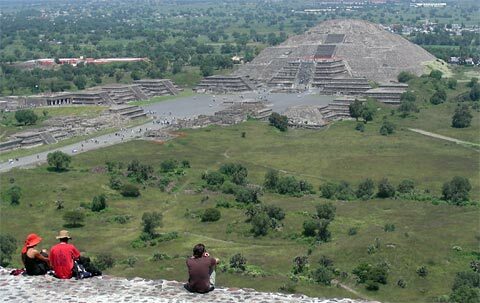 So for instance the famous pyramids, just 40 km from the city. 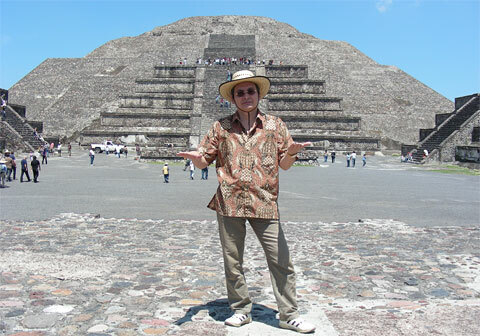 The Pyramid of the Sun is 246 feet high, making it the third largest pyramid in the world. 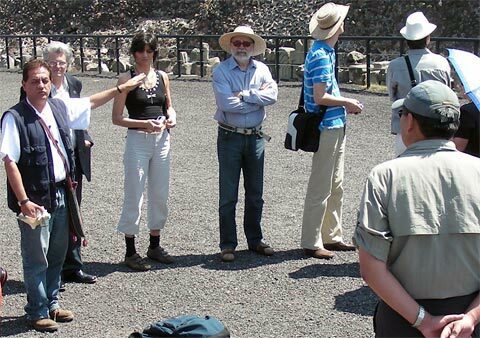 Teotihuacán was, as our photo report shows, a spiritual experience. 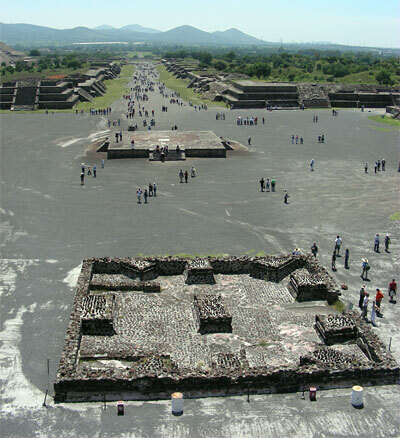 Teotihuacán, the goal of an excursion arranged for journalists and dignitaries on one of the free days, is the largest pre-Columbian city in the Americas. 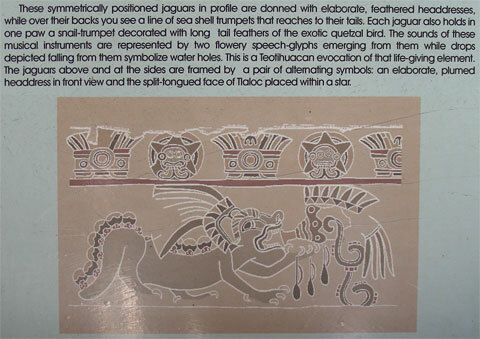 The city, located approximately 40 km (25 miles) northeast of Mexico City, reached its zenith between 150 and 450 AD, when it was the center of a powerful culture whose influence extended through much of the Mesoamerican region. 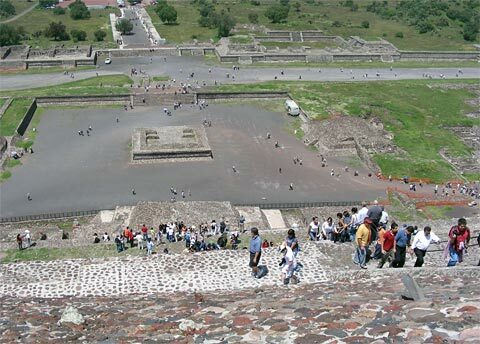 At its height the city covered over 30 km² (over 11 square miles), and probably housed a population of over 150,000 people, possibly as many as 250,000. 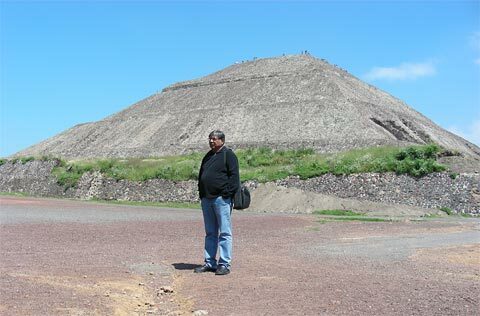 Our video partner Vijay Kumar from India pauses (and poses) in front of the giant "Pyramid of the Sun", the second largest in the New World, after the Great Pyramid of Cholula. During the 7th or 8th centuries the city was sacked and burned by invaders, or possibly destroyed in an internal uprising. 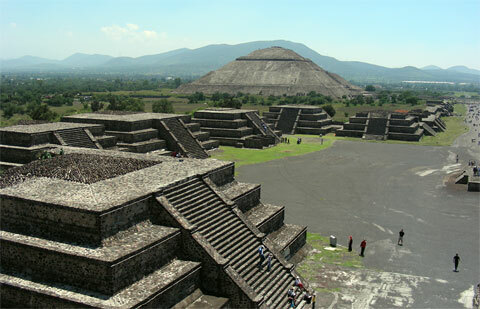 In any case the decline of Teotihucán has been correlated with the droughts related to the climate changes of 535 – 536 AD. So this, apparently, is not just a problem of our time. Before we can embark on our expedition to these monumental structures, and actually scale them, there is some vital equipment we need to procure: protection from the sun that is ruthless at an altitude of two and a half kilometers. 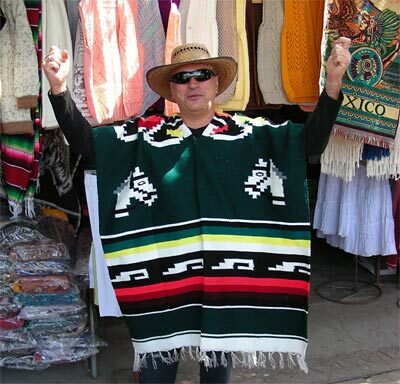 FIDE vice president Zurab Azmaiparashvili goes for a hat and a poncho, which can be purchased at the bus station at the base of the pyramids. That's Frederic Friedel and Dennis Monokroussos in the picture above, both very prudently wearing Mexican sombreros they had purchased for $2 each. Others, like a Dutch journalist we know and respect, did not bother and returned from the trip looking like a carrot. He did not sleep well that night. Berik is not from Kalmykia, as many people believe, but from Kazakhstan. He met Ilyumzhinov when both were in college and has been assisting him in all matters, but especially those related to chess, ever since. He speaks excellent English and has a wry sense of humour, which makes him great fun to be with. 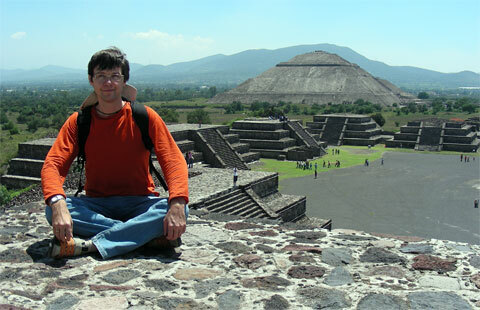 The Pyramid of the Sun is 738 feet across and 246 feet high, making it the third largest pyramid in the world. 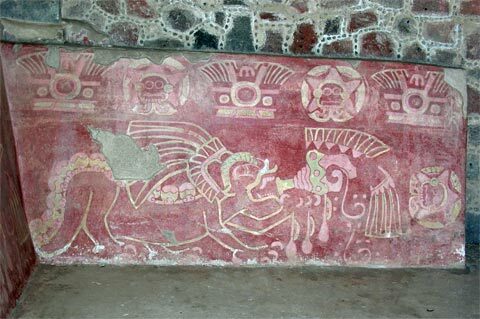 Originally it was covered with lime plaster and brilliantly adorned with colored murals, which have unfortunately disappeared. What a spectacular sight it must have been. 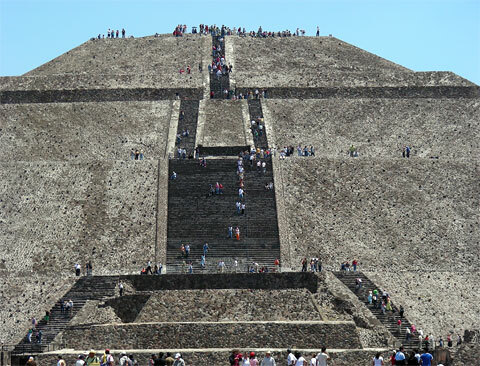 The pyramid has astronomical features: it points to the setting sun on two days a year, August 12 and April 29, dates that were important in terms of both agriculture and belief systems of the ancient society. 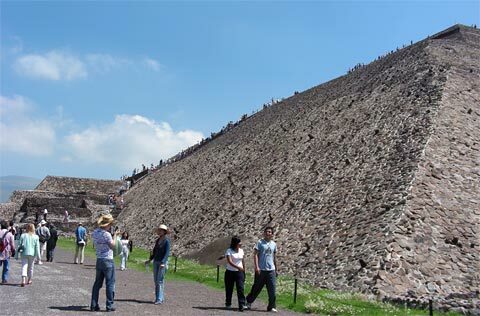 There is a cave located six meters beneath the center of the pyramid, which probably served as a royal tomb. Scientists have used muon detectors to try to find other chambers within the interior of the pyramid, but so far without success. 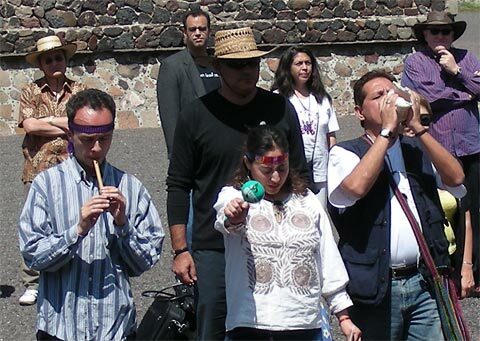 At this stage we ran into a problem: our guide, a Mexican named Gerardo Roberto Sandoval Monroy, turned out to be a Sufi convert who called himself Said and had a passionate interest in half a dozen other mystical and New Age philosophies. 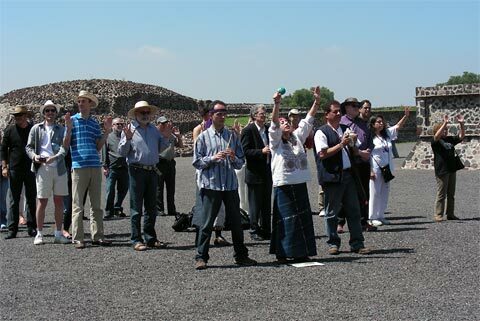 Said announced that we would not be climbing the pyramids but visiting all the spots where the energy of the Teotihuacán pyramids, the earth, the moon, Venus, the solar system, the galaxy and the Universe itself converged and could be tapped for the spiritual benefit of us visitors. Said asked our group to build a circle, hold up their arms and face in the four mystical directions (north, south, east and west), while he appealed to the above mentioned forces to descend upon us. Not all the visitors followed suit; some walked around sullenly, taking photographs and shaking their heads. The ceremony included conch blowing, a flute and a rattle. You may recognise Berik, Zurab and Spanish journalist Leonxto Garcia (purple shirt) in the picture above. At this stage a policeman intervened and asked the group not to engage in pagan rituals. He especially objected to the conch blowing. Said simply ignored his admonitions. 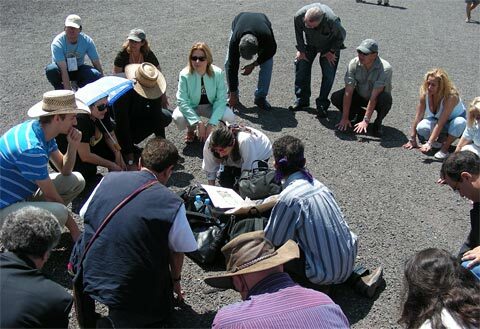 It all ended with people touching the earth to absorb the energy summoned by the ritual. 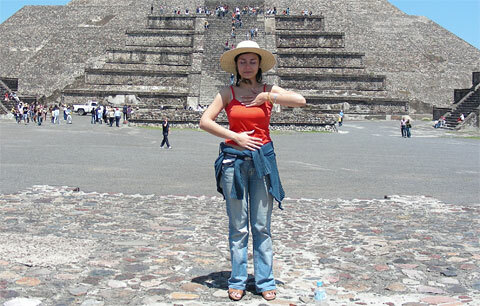 At this stage Said wished to proceed to the other energetic points that surrounded the pyramids, but faced a rebellion by a majority of our group, who wanted to climb the pyramids and learn more about their history, architecture, the building technique and other mundane questions, even if it meant passing on the energy thing. Said agreed, and climb we did – not an easy task for chess associated people who normally maintain their fitness by castling queenside. One must mention that some in our group were not yet fully acclimatized to the altitude of the Mexican plateau, and that in some passages the steps were high and steep. But most made it to the top. 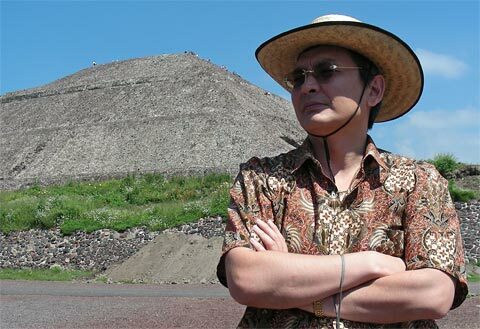 After reaching the top you are rewarded with a spectacular view of the surrounding landscape and the Moon Pyramid, to which we will proceed shortly. As chance would have it, at the top our hero Said (who has a sense of humour and knows that I will be writing in this vein) found a new energy focal point, which required immediate rituals. On the right is Elmira Mirzoeva, a Russian TV and radio journalist. In spite of botching up the ritual (it's one hand facing Earth and one hand the Heavens, Elmira!) she clearly felt the forces that flowed through her. 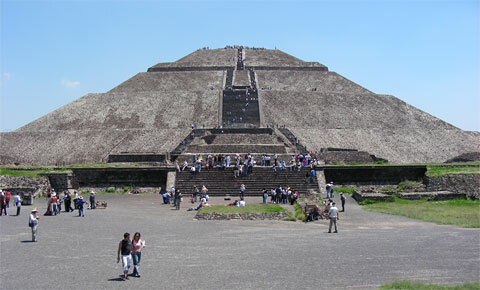 The Teotihuacános practiced human sacrifice, especially during the consecration of the pyramids and other new buildings. The victims were mostly enemy warriors captured in battle and then brought to the city to be ritually sacrificed so the city could prosper. Said glossed over this subject, saying it was "traditional" at the time and not practiced today. No big surprise, that one. The broad central passage is called "Avenue of the Dead" ("Miccaotli") and is flanked by impressive ceremonial architecture. It is also filled with vendors trying to sell you blankets, obsidian statues, bracelets, masks, and other trinkets, all at just a 50% markup when compared to stores in Mexico City. A modern-day denizen seeking contact with the passengers on the bus ride back to the hotel. It paid with its life for its wholly inappropriate intentions. We were told that there might be general problems in Mexico with mosquitoes, but the Sheraton Hotel is perfectly insulated and we are yet to encounter one of these horrid little pests in our living quarters. 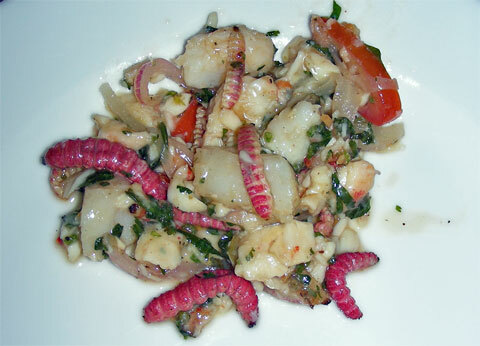 Talking about bugs: look what was on the menu that evening: cactus caterpillars in the sea-food ceviche. They were edible (of course we did! 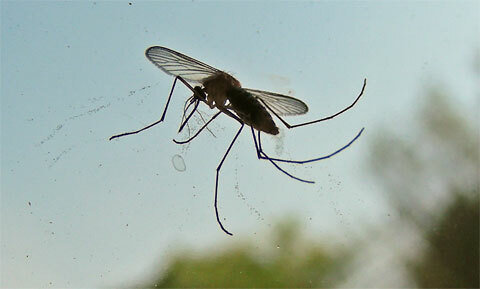 ), though not particularly delicious or addictive. << World Championship Mexico, Round 11 – Anand! !